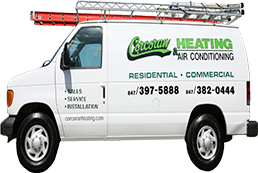 Corcoran Heating and Air ConditioningHow Can Corcoran Help? At Corcoran Heating and Air Conditioning, we don’t just fix your heating and air conditioning equipment—we focus on the health and performance of your complete comfort system. We guarantee that our technical approach to service and installation will make a significant difference in the comfort of your home or business environment, while potentially saving thousands of dollars in heating and cooling costs. Additionally, our exceptional services can benefit the environment by reducing your carbon footprint. Our technicians are committed to making your home, office, or business environment as comfortable, healthy, and safe as possible. If you’re fed up with high utility bills and uncomfortable environments, give us a call. Our factory trained, NCI- and NATE-certified technicians are available 24/7/365 to handle all of your residential or commercial air comfort concerns, quickly and competently. After gaining a full understanding of your HVAC needs, we will clearly communicate our recommendations, including all costs, time, and scope of work. As a family-owned business, Corcoran values your time, respects your space, and works hard to exceed your expectations.